Resolution is a magical word for audiophiles. We like to hear everything. And to do so we end up spending a huge amount of money to extract, literally, ever bit we can from our source material. A good system today can resolve virtually all nuance that the recording contains -- picking up almost microscopic detail. While all the components in the chain must be of top-notch quality to achieve this accuracy, any 'phile worth his or her salt knows that what comes out can only be as good as what goes in. A lousy recording can make the best system sound poor, while a great-sounding recording can make a lower-end system scale the high-end ladder. Current CD technology is limited to a 16-bit word length sampled 44,100 times per second. While perfect sound forever was the anthem of the early 80s, many of the engineers who proclaimed it now admit that the current CD specs were a little short-sighted and offer compromised sonic results. However, all this is poised to change. Technologies such as DVD promise, and have delivered, higher-resolution signals in the ballpark of 24 bits sampled 96,000 times per second. Other technologies promise even greater things. However, as usual, there is widespread debate, and what we will eventually settle on as an "industry standard" is anyone's guess. One thing is for certain: Although we seem destined to get another digital playback format of higher resolution, we currently have, and will continue to have, a 16-bit/44.1kHz catalog of fantastic music for many years to come. So technologies that improve performance for our existing collections are worth checking into. Over the last few years a number of technologies have emerged that have attempt to either extract more information from the CD datastream (HDCD, for example) or bring a higher-resolution recorded signal, say 20- or 24-bit, down to that 16-bit/44.1khz format and retain at least some of the sonic characteristics of original signal (Sony's Super Bit Mapping, for example). The type of resolution enhancement that the Camelot Dragon Pro2 Mk 2 performs falls into the extracting-more-information camp. 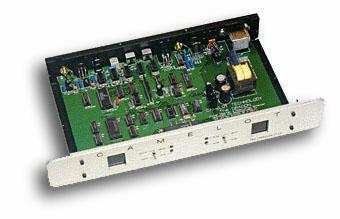 However, unlike HDCD, which relies on embedding HDCD information in the 16-bit signal, the Camelot unit performs its rez thang on standard 16-bit signals (if an HDCD signal is encountered, it simply passes the data unaltered). To use the Camelot Dragon Pro2 Mk 2 you must have digital separates, meaning a dedicated transport and DAC -- the Dragon connects between them, so youll also need an extra digital cable. I use a Theta Data Basic transport and a Prime II DAC along with Nirvana's Digital Transmission coaxial cable, with the other cable being the Temporalis coaxial cable. My standard system setup consists of my Blue Circle BC3 preamp and BC2 amplifiers with speakers ranging from the Gershman X-1 to the Merlin TSM to the Speaker Art Clef. Resolution enhancement is done via the Dragon with a flick of the switch that's located on the front. One flick and enhancement is off completely; another flick turns it to 18-bit mode, and yet another cranks it to 20-bit. What's best for you? It depends on your DACs input receiver, which will normally be 18- or 20-bit. Theta Digital tells me that my Prime II will handle 20 bits fine. How exactly does the resolution enhancement work? I don't know other than that Dragon Pro2 Mk 2 employs some digital signal processing (DSP) inside with more bits coming out of the unit than went in. Having the switch on the front with the ability to flick, flick, flick at any instant makes comparisons between 16-, 18- and 20-bit output a snap. So does it work? Yup! The difference is clearly audible on a very good system -- but subtle. Memory of the now-defunct Audio Alchemy DTI Pro32 tells me that the difference is more subtle than that units effect. That's neither good nor bad, just different because the DTI Pro32 seemed to give the midrange more bloom, but I don't recall the detail and ambient information improving as much as it does with the Dragon Pro2 Mk 2. Unfortunately, I don't have a DTI Pro32 on hand to give the two units a head-to-head comparison, so results are speculative. Improvements were not night-and-day, nor were they drastic as with a tonal-balance or frequency-response change. In fact, they were more subtle sometimes than a phase inversion (a feature also available on this unit). However, what I heard should not be underestimated because for audiophiles wanting more, more, more, things were definitely better. I noticed an increase in low-level detail that resulted in a more spacious soundstage with an improved sense of depth, slightly improved image focus, and a cleaner treble performance. With a very high-resolution pair of speakers like my Merlin TSMs, the difference was more pronounced than with speakers that are not as resolving of detail. What I heard was not earth-shaking, but it was consistent -- and in all cases better. Based on the resolution-enhancement feature alone, I cannot say that the Camelot Dragon Pro2 Mk 2 is worth a $1,595 investment. However, as I mentioned in the July 1998 Sneak Peek, the Dragon is an exceptionally versatile processor with many features, resolution enhancement being only one, so you can't judge it by that alone. Next month I will describe my jitter experiments with my own transport, a DVD player and a portable CD player, so stay tuned.